The older paintings are often larger than the newer ones. 16 in. x 20 in., 20 in. x 30 in., or even larger, are not uncommon sizes for the California Impressionist paintings. The newer paintings are more frequently 12 in. x 16 in. or smaller. The earlier paintings are often more carefully painted, with more precise strokes and harder edges than the newer ones. Many of the newer ones are very think paint applied very quickly—not slapdash, but also not carefully controlled. The influence of the intervening century of abstract painting, perhaps? The color palettes of all of the painters are similar. Few if any blacks, no strikingly different color ranges such as illustrators might use. The individual pigments might be different now from a century ago, but the range of colors are similar. And in this show, mostly California colors and light. While this is a nice exhibition, and an interesting conceit, it’s also true that none of these paintings represent the best work of the earlier artists, and probably not the contemporary painters, either. I don’t mean these aren’t good paintings—they are. A couple of them are very good indeed (take special note of the Ken Auster painting of houses near the beach). But not every show can be full of masterpieces. In fact, as I think about it, these are plein air paintings. A plein air painting can only be worked on for a couple of hours during the day, or the light changes too much. I suspect the larger early pieces were painted over a couple of days, at the same time each day. But they’re not studio pieces, which can be worked on for longer periods. And maybe that’s part of the point of the show: that plein air paintings can be nice, even very good—but they are rarely masterpieces. Then and Now: 100 Years of Plein Air Painting runs through October 2, 2014. Have you seen the show? What did you think? Do you like plein air painting? If you have the opportunity to get to San Diego this summer, by all means do so. Americans have the very rare opportunity this summer to see an exhibition of paintings by Joaquin Sorolla y Bastida at the San Diego Museum of Art. Though Sorolla was quite well known in his own lifetime (some 50,000 people came to his funeral, according to the exhibition catalog), he was then all but forgotten by the public. 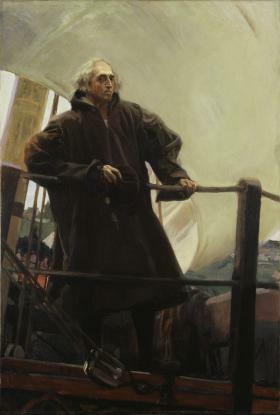 Joaquín Sorolla y Bastida, Christopher Columbus Leaving Palos, Spain, 1910, oil on canvas. The Mariners’ Museum. The photo doesn’t do it justice. Which is a shame. Because, like his contemporary John Singer Sargent, Sorolla (pronounced So-roy’-ya) was an extraordinarily gifted painter. This exhibition focuses on paintings made in or purchased by Americans (or both), including a portrait of President William Howard Taft. The exhibition include portraits of patrons and society members; seascapes; a few landscapes; and a number of gouaches painted from his hotel room in New York, and drawings made on the back of hotel restaurant menus. OMG. The show is amazing. People always talk about Sargent’s “bravura” brushstrokes. I hate to compare Sorolla to Sargent, but that’s the point of reference I think viewers might have. Sorolla’s brushstrokes remind me of Sargent’s: the sweeping strokes of paint to indicate the folds of cloth in a sitter’s gown; or, in an otherwise shadowy room, the single thick stroke to indicate a sliver of light on a girl’s shoulder. The painter’s energy is evident in each brushstroke. Sorolla apparently loved the challenge of painting quickly, which in part accounts for the energy of his outdoor scenes (all painted from life, even the large ones). The portraits are sensitive and glorious. The seascapes are filled with life and emotion. The large paintings of specific scenes—handicapped boys at the beach for an outing; or a woman in shackles, arrested for having murdered her child (today we’d call them political)—are also filled with emotion and sympathy. The day I was at the exhibition, many of the visitors were painters. Snatches of conversations I overheard were all about this shadow or that bit of painting, or his use of color or how he changed the paintings from his sketches. And for artists, this show has a couple of treats: sketches made in preparation of paintings. These sketches range from very small oil studies for large pieces, to drawings made to work out the composition for one of his paintings of children at the beach, to a series of nine rather large oil studies made in preparation of a commissioned portrait of Christopher Columbus. Sorolla apparently found one of Columbus’ descendants to pose for the portrait. The nine sketches included here show Columbus in a variety of heroic poses, all eventually rejected for a quieter, more sardonic portrait of the man at the slanting rail of his ship, framed by one of the ship’s sails, with just a bit of horizon peeking out near the edge of the painting. It’s a remarkable portrait, even if today Columbus’ legacy is considered to be far more mixed than it was when the painting was commissioned. One word of caution: parking at Balboa Park is quite limited, and the place his hugely popular. On the Tuesday I visited, we drove around for about half an hour looking for a place to park. Look into public transportation, or get there early. Tickets are not timed. And the museum restaurant is currently closed, though there are other restaurants in the park. Sorolla and America runs through August 26, 2014. Have you seen Sorolla and America? What did you think?